Discussion in 'Prime Audio, Electronics, and Infotainment' started by 7707Prime, Mar 4, 2019. 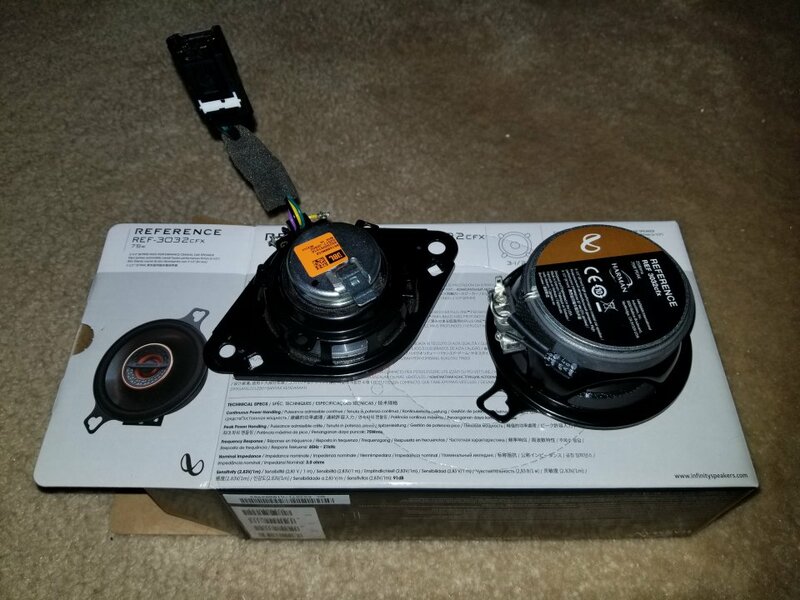 There is a really great thread that @orangebang did over on the Gen4 forums on how to upgrade the speakers on the non-Prime and non-JBL setup here: Prius 2016 4th Generation: How to remove door panel&quot; and my speaker install.  | PriusChat. 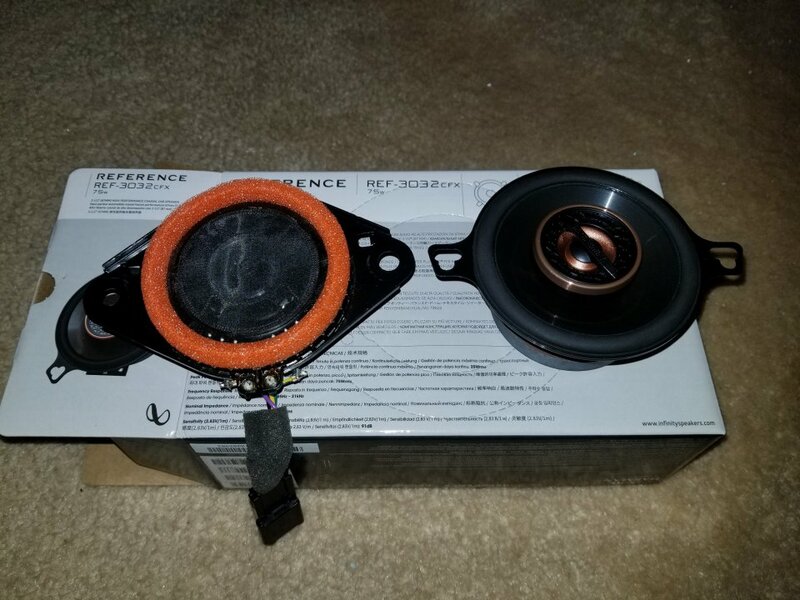 His directions worked almost flawlessly for me on my upgrade, but there was one head-scratcher I ran into, and I wanted to throw in some additional JBL details that I found. The main difference in the installation process is that the dash speakers are wired differently. Crutchfield does not have an adapter for them, so you will need to reuse the wiring harness from the factory speaker unless you want to cut into the car's wiring harness. Here is a comparison of the stock JBL dash speaker to the aftermarket ones. Orange = JBL. You will cut the wires at the solder points above. The cables factory-marked with the blue dot are the positive leads. You only need to reconnect one set (green and black OR yellow and purple) to the new speakers. Finally, a look at the difference between the door speakers. Again, the orange are the stock and the others are the aftermarket. My jaw about hit the floor when I saw that even the JBL system gets the same "marshmallow" speaker magnets that the stock speakers get. So far I have only done the dash and rear door speakers, but there is already a night and day difference in the sound quality. I don't expect any more differences from his directions on the front doors, but will update this post if I find any. Did the front speakers over the weekend. 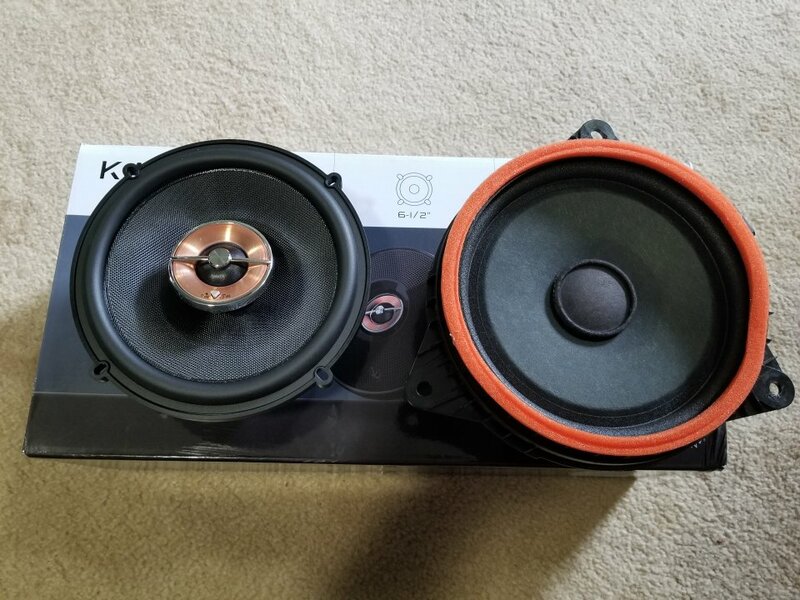 No differences in the directions, however, the front door speakers are woofers only, with a little bit more magnet than the rear speakers. Again, the orange is the stock JBL speaker. After installation, the full-range speakers in the doors only produce bass, and the bass needed to be turned way down in order to get speech sounding mostly intelligible again. I'd call the upgrade an overall success, but may look to an aftermarket amplifier down the road to get full-range sound all around if I can't get the speech fidelity where I'd like it to be. Can anyone explain why there are 4 wires connecting to the dash speakers? I showed the picture to a local Best Buy geek and he couldn't explain it. If you don't reconnect the correct wires, is some frequency range possibly lost? 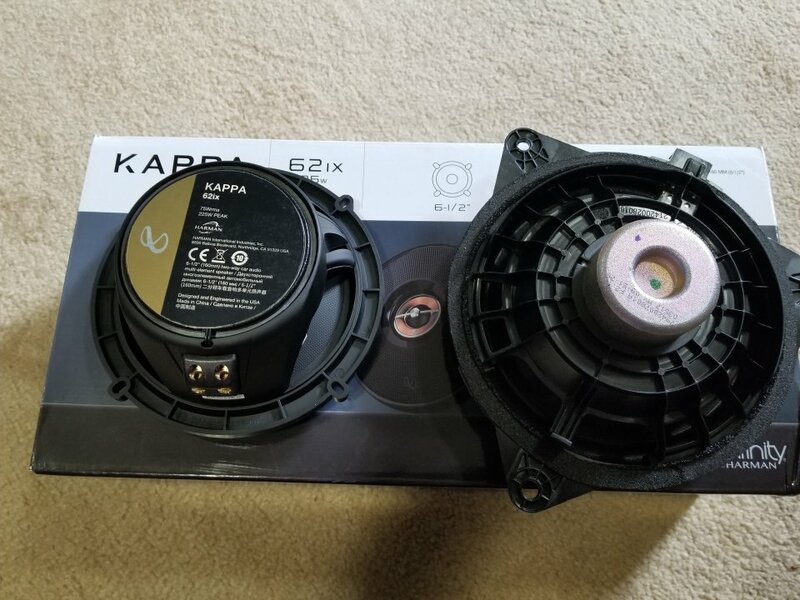 Are the dash speakers bi-amped? I am getting good highs and mids (and some lows - the new speakers have resistors for a crossover frequency around 120Hz) off of the new dash speakers just using the black and green wires. Still having issues with certain spoken vocal frequencies, which I think is a confluence of factors - the radio stations I'm listening to, resonance in the dash from extra bass, and the equalization of the stock head unit/amplifier. Cranking up the mid range 3-4 pips helps, but isn't a full cure. However, music OTA or via Bluetooth sounds positively amazing with the new setup. Did both left and right dash speakers have 4 wires connected? Or did the left have 2 wires and the right 4? The colors in this diagram don't match your pictures. Thanks. 4 wires on both dash speakers. 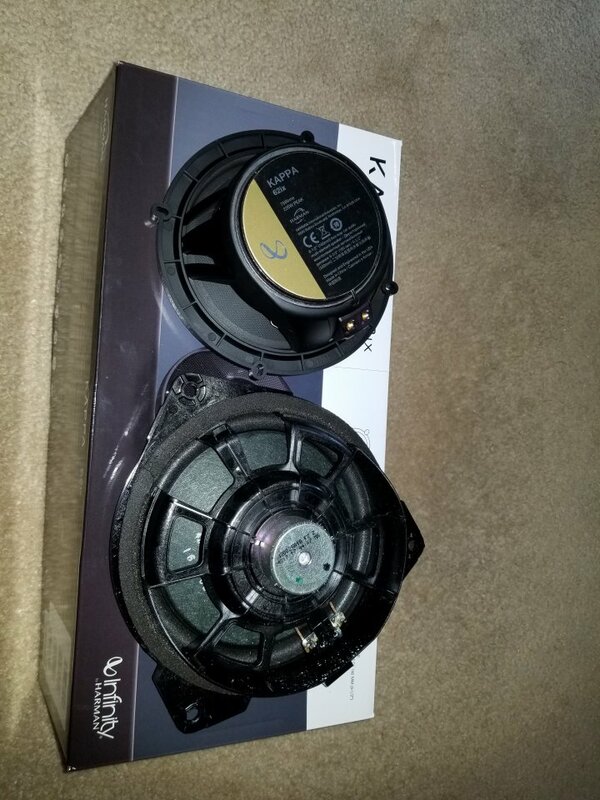 I've been communicating with a very nice man named Gage at Crutchfield about the dash speaker connections, trying to understand why there are 4 wires connected to each speaker. 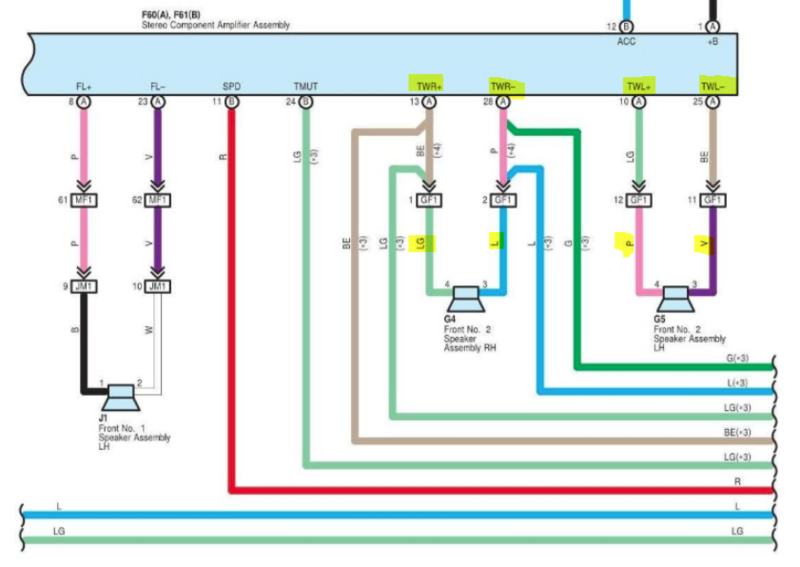 He cannot find a wire diagram that matches the colors shown in the pictures above. 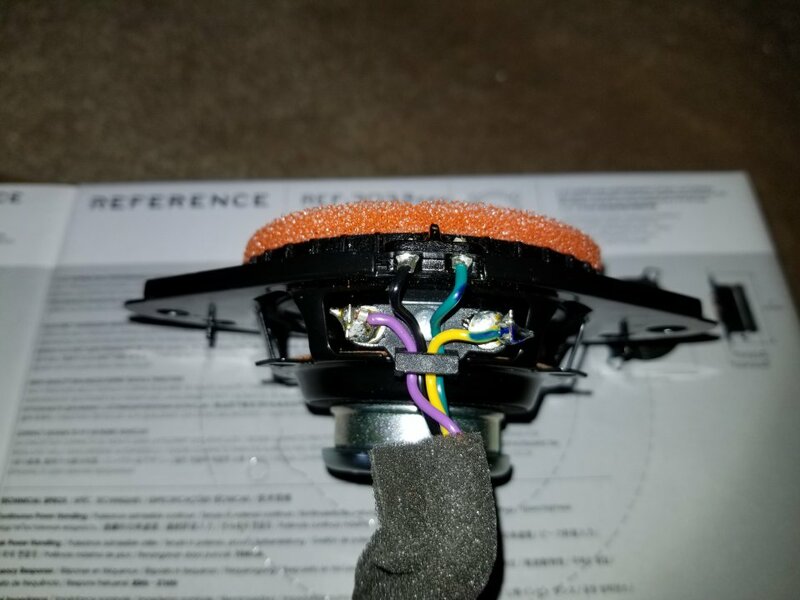 He asked if 7707Prime(installer above) might have noticed whether the color of the wires where they connect to the speakers might change to a different color at a junction of some sort shortly after the wires dive deeper into the dash. If 7707Prime noticed a color change, please share. Could this possibly shed some light as to why 7707Prime is only getting low frequencies from the door speakers? I am anxious to switch out my harsh-sounding dash speakers! Thanks again. The front door speakers appear to have some kind of a high-pass filter on them, so that only low frequencies pass through. Nothing was visible with the door panel off, so my guess is that this is a function of the amplifier which is supposed to be under the driver's seat. The dash speakers appear to use a variant of the door speakers' wiring harness - in retrospect, the connector looked very similar but I didn't actually try it out. Two leads only - the green and yellow both go to one wire (the positive lead - used a multimeter to figure it out), and the black and purple go to one wire (negative lead). May I ask how you ended up choosing the Inifinity 3032 for your dash replacement? 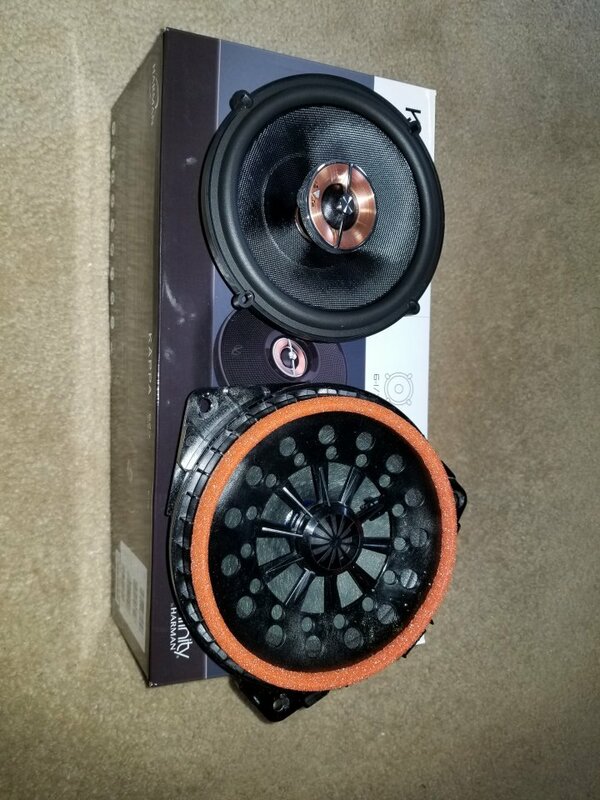 Curious how they sound compared to the stock JBL. Did you consider other options? Why 4 wires connected to Prime Advanced dash speakers? Any info on JBL speaker system specifications and amp install? Is it possible to request for JBL option on Premium trim level?